let's discuss: Should Opera's Dress Code Be Grand Too? As many of you know, Grand Opera is coming back to Baltimore this season. Lyric Opera Baltimore will be ringing the season in with style by presented La Traviata. 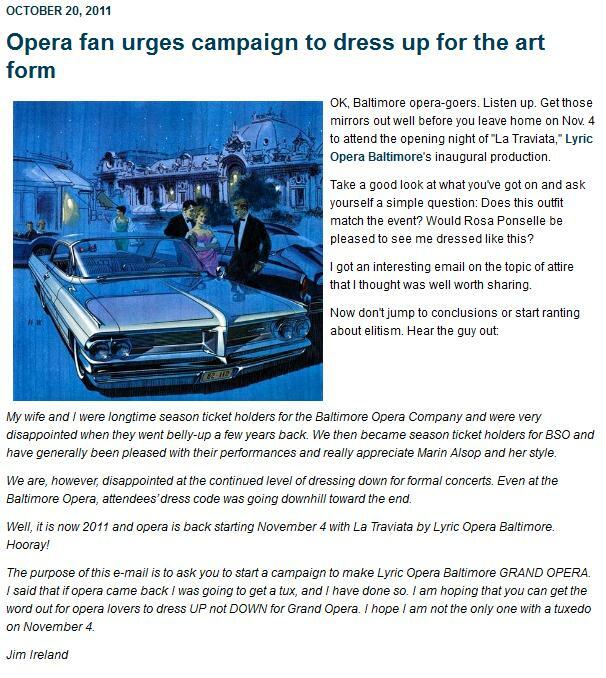 While perusing our Baltimore Opera Blogosphere, I happened upon a letter written to Tim Smith that he posted on his blog Clef Notes and Drama Queens. Now, frankly, I am happy to read this letter from Jim Ireland. Why? Because he is excited! He is excited about the return of an institution that brought him high-quality entertainment. Ireland isn’t advocating that we all wear tuxes to every opera performance we attend. He is simply campaigning to show our love for this group by donning our better duds for the OPENING NIGHT. Well, Jim, I will also be there on November 4th and I promise that I will be dressed to impress. I encourage the Sybaritic Faithful to join me and make it a special night. Will you be attending the opening night? Feel like reveling after the performance? Come join me as I party with the sybarites in the Baltimore Classical Voice and Opera Meetup. I stand by my “I’d rather see blue jeans than empty seats” comment, but I am really glad to see that some folks are looking to make this a special event. From my perspective, as someone who sang regularly with the old company, this is truly a special and remarkable event. Going to rehearsals this week has been like “old home week.” We’re all so thrilled for Maestro Harp, and ecstatic to be playing on the home field again. There was so much negativity (rightfully so) surrounding the collapse of the old company, it would be terrific if there was an equal amount of positive energy surrounding the launch of the new one. Jim’s idea is a fun way to show support for the new company….I hope it catches on, and we’ll just have to trust that it doesn’t make you look like a snobby, elite “opera” person…rather someone that has true excitement and pride in the fact that after three short years (well, OK, they were pretty long years) grand opera is back at the Lyric! I completely agree with your comment. I want people to enjoy performances. If that means you march to your own sartorial drum… that’s fine. Just show up. Although I don’t want to discount all the hard-work our many hometown opera companies have been doing during the last few years, it is downright nice to have Maestro Harp back at the helm of this grand company. All that to say – I’ll leave my elitist heels at home and just wear the “opera rocks” ones instead.